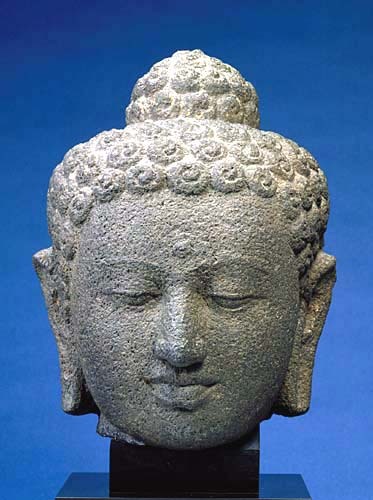 This representation of the Buddha is characterized by a broad, majestic and serene face with lowered eyes. The very slightly hooked nose and the mouth, with its rather thin, well defined upper lip and thicker, fleshier lower lip, are peculiar to images from Borobudur. Although the hair, with its ample curls spiralling to the right and the rounded shape of the face both relate to the Indian Gupta (4th-6th century) model from Mathura, in its overall tenor the work displays an affinity with sculpture from the post-Gupta and Pala periods. It is, in fact, the head of a jina, a spiritual entity in mahayana Buddhism belonging to a pseudo-pantheon of deities only visible to bodhisattva. Their iconography is based on that of the life of the Buddha Sakyamuni. Like practically all Javanese lapidary art, this work is carved in andesite, a volcanic stone. The Middle Java period to which this work belongs corresponded to the building in the centre of the island of great edifices such as Borobudur. Middle Java art produced many sculptures in the round and, unlike Eastern Javanese period art (c. mid-10th century-early 16th century), favoured high relief.